There are a few people whom I would call “friends” in my life who still do not know the stories of Brae’s and Sienna’s journeys into our family. I had one such friend over yesterday for a playdate. It was on the tip of my tongue to tell her. We’ve known each other for over a year and I want to tell her about Brae and Sienna’s adoption stories. I want to tell everyone, because Brae and Sienna have the coolest stories. But, I hesitated. And, by the time she left, I still had not told her. Don’t get me wrong, I don’t lie to anyone. If I’m ever asked a straight up question that requires me to disclose that either one of them is adopted, I answer it truthfully. But, I no longer volunteer. Because, I’ve come to realize, Brae’s story and Sienna’s story are each their own. They are not mine to tell. I’ve learned this more and more as Brae has gotten older, and developed friends outside my group of friends. He has friends outside my circle of playdate friends. He has friends at school, he has neighbor friends. He is his own person. He knows he is adopted, knows who his birth family is, and if he wants to share his amazing adoption journey, then who am I to trump that? Similarly, if he does not want to share his amazing adoption journey, or wants to select with whom he shares, again, that is his choice. As proud as I am of him, of Sienna, and of each of their journeys, I recognize that adoption is a highly personal journey. Yes, I have my own part in that journey that I am entitled to share, but I have to be mindful that Brae and Sienna do too. And, their choice to share may be different than mine. I need to respect that. Saturday was the big day! I felt like I could write the handbook on how to survive a full bladder and medication of an embryo transfer. I was surprised how relaxed I felt and the faith that I had in putting everything in God’s hands. Our embryo’s survived the thaw! Hallelujah! We were able to transfer a 5AA and 4AA siblings, there were only 2 embryos left. I am so thankful today for these precious lives! It was also wonderful to see all the staff at NEDC. I truly appreciate the care that is given to bring about the opportunity for these lives to find homes. I was not able to meet any of the other families as we were at the end of the list that day. The transfer went the smoothest out of all of them. It has been five days after my transfer and I have had some implantation cramping and am feeling fatigue. I won’t be one of the mom’s rushing to the store to get a pregnancy test. I feel confident that somebody is settling in their new home. I have been thinking and praying for all NEDC moms waiting for news on their transfers. The wait is so hard and can be a challenge to focus on life. Then we all have to wonder and wait for the HCG levels and ultrasounds. I have to say the ultrasound is the most worrisome for me, as I have had the vanishing twin syndrome and several miscarriages. Ultrasounds have a way of dragging out the worst outcome for a period of time that seems like an eternity of wait and misery. My heart is sad knowing that these are the outcomes that come along with FET. I think more so than regular pregnancy. These embryos go through so much with being frozen and thawed it’s a miracle they even survive at all. I hope everyone can find comfort in knowing these babies are loved by you and no longer frozen even though they may not survive. During my first transfer, I transferred 3 embryos and I was devastated when they all perished. This was a hard reality and it took some processing time. I remembered I needed some closure to heal from this. I bought a Christmas ornament that was a nest with 3 eggs in it. It is a memorial I hang on my tree every year. A reminder of the love I have for those babies. Over time the sorrow gets better but the memory will always be strong. I have no regrets. As I have gone through each transfer that is the question I always ask myself. Will I regret the outcome of a failed transfer? The passion I have for embryo adoption has not changed but grown stronger with each one. This last weekend, we attended a very special wedding. The wedding was about 3 hours away. We loaded into the car on the sweltering hot Friday afternoon and prepared for the long ride. Brae and Sienna were occupied with a movie, and I was just praying that Graem would stay asleep the whole ride. (He almost did – the last 20 minutes were a fun-filled screech fest). We rolled into the sleepy little town shortly before the ceremony. This is a small town. A very, very small town. Quaint. Beautiful. We pulled into the church parking lot just in time. Tygh took Brae and Sienna into the church while I tugged Graem out of his car seat to nurse him. Since I didn’t want to make a scene nursing Graem in the church, I just nursed him in the car, praying no one noticed me. (I don’t think I succeeded). I slipped into the church just in time to see Brae’s birthmom walk down the aisle. She was stunning. This amazing, gracious young woman who changed our lives 6 years ago. As tears rolled down my face, I slid into the back pew. I couldn’t believe this was my life. I was sitting here, with my three amazing children and my awesome husband, watching the young woman who delivered our son in a stark hospital room on a sacred Halloween night, now in a lovely white dress, beaming. I felt tremendously blessed. I was pulled out of my daze abruptly by seeing Sienna out of the corner of my eye emerge from the bathroom, naked, running toward the wedding aisle. I catapulted Graem into Tygh’s arms, and grabbed her before she made (any more of) a scene. 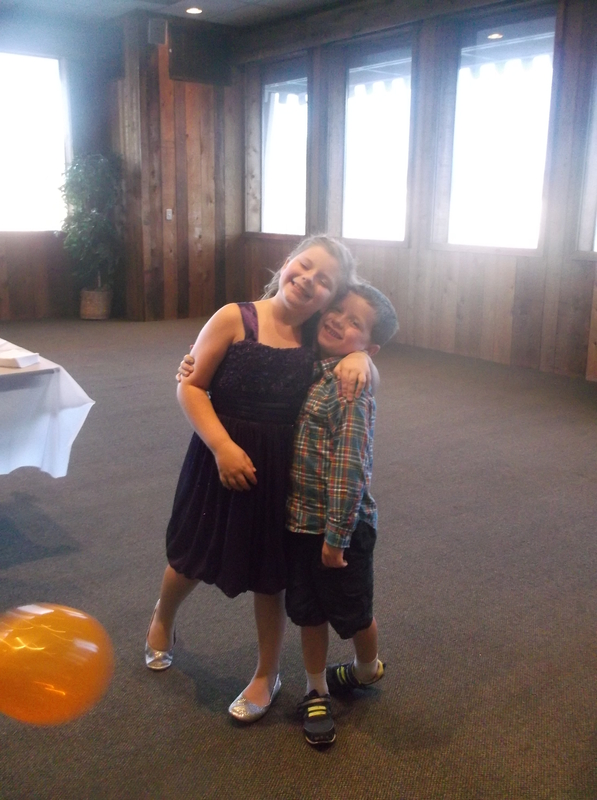 We didn’t get to speak to Brae’s birthmom until the reception. But when Brae saw her, he glowed. This is the first visit where I think he has finally understood who she is to him. 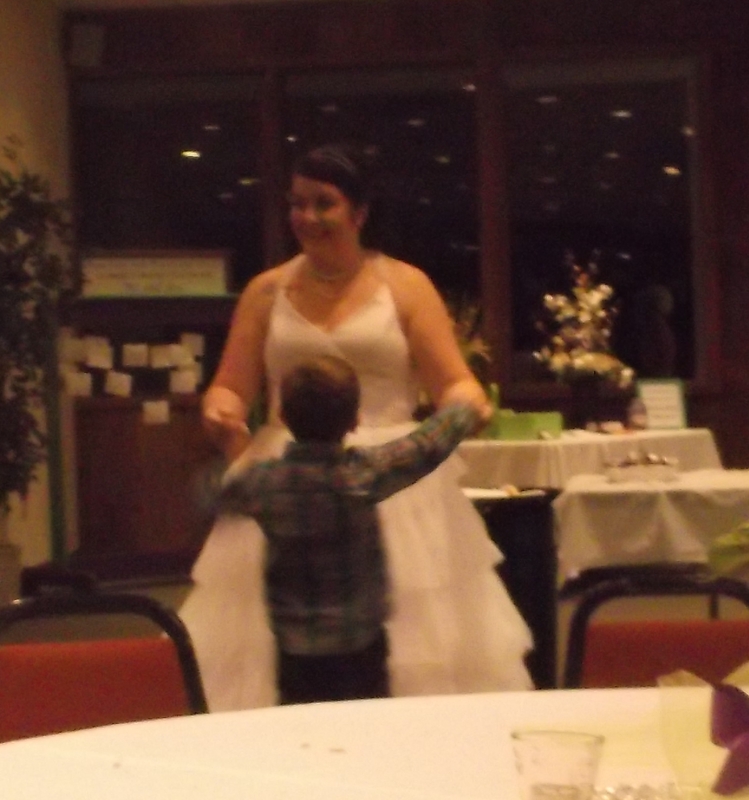 He marched right up to her, told her she looked beautiful, and asked her to dance. It took my breath away, watching them, swaying to soft music. I was so proud of him. So in love with him at that moment. So happy for him. The rest of the night was glorious. Family member after family member (many who had only heard of us and Brae, but never met us) came up to us to introduce themselves. Many had tears in their eyes as they told us how grateful they were that we came. How Brae seemed like such a happy little boy. I was the one who felt grateful. I mean, how many people get to experience the awesome journey of adoption? It is just surreal. It is such an amazing journey – hard at times, of course. But this, oh this, is what makes it so divine. We watched Brae run around after his half-sister, marveling at how much they were alike – in looks and in personality. We giggled (shamefully) as Sienna zoomed across the dance floor, crawling through elderly couples’ legs sashaying across the hardwood. We had intensely meaningful conversations with Brae’s birth cousins, grandparents, aunts, uncles about the pain and beauty of adoption. And, when the night came to a close, we had memories. Tremendous memories. As we loaded the kids into the car, and Brae gave just one last hug to his half-sister, we felt content. We (and Brae) had even more friends and family than we knew. Who loved us. Who prayed for us. And that is what is so special about open adoption. September 17 marks 5 years since our embryo transfer. Five years since we saw Grant and Maria as tiny perfect embryos. Five years since we started our journey as parents. It feels like yesterday and a decade ago at the same time. I loved them the moment I saw them. We prayed for clingers. We wondered what was going on inside me. Was it going to work? It’s a strange feeling being hopeful for a positive result while simultaneously preparing for the next steps and how to handle it if it didn’t work. Five years down the road we had no idea what our life would look like today. We couldn’t picture the perfect children that God would give us. We had no idea that Jeremy would be a stay-at-home dad and testing out home school. All I knew at the time is that I wanted a baby (or two). A positive pregnancy test and healthy baby was the end game on transfer day. Five years down the road our family is complete. The thought of a spontaneous pregnancy is exciting and panic inducing at the same time. I asked Jeremy if he wanted to get a vasectomy….just in case. Feeling confident in the deficiency of his swimmers, he declined, but stated he had the same thought. Five years down the road still worry about the fate of Grant and Maria’s ten remaining genetic siblings. I pray that their special consideration label won’t scare people off and encourage those who are in the process to consider these and others with special considerations. They are worthy of life out of the freezer. I know we were blessed with our decision to honor God’s direction. Five years down the road, I’m still beyond grateful for the gift of embryo adoption. Next week, I will be having my final embryo transfer. I had my first successful transfer in 2012. As I am full of raging hormones and intense expectations, I am holding on to the hope for a brother or sister for my sweet Vivienne. I only have 2 embryos left to use. The process before a transfer is very agonizing. It is amazing how many emotions a woman can work through in the journey of embryo adoption. It is a constant reset of emotions over and over again. I am very big into research and gathering information from a collaboration of different sources. The big question I read as I have collected information on embryo transfers has been – How many to transfer? The discussions are intense. I believe the outcome that most people want and most doctors will support is one healthy baby. The idea of transferring more embryos to produce a better outcome can lead to sorrow on many levels. I feel it is better to be cautious than to allow a desire of a pregnancy to persuade women emotionally when making this decision. From experience, I feel seeking out wisdom from professionals who know the outcomes well and women who have had experiences with transferring their embryos can be helpful in making the final decision in how many embryos to transfer. This week I reached my emotional melt down and called the embryologist in hopes to secure an answer for my anxieties (like she would guarantee a successful transfer with the outcome I wanted). I feel that is what every woman wants and a 100 percent guarantee of success. After all the work, isn’t that what we all deserve? 🙂 The call made me feel more prepared for my transfer with expectations put in place, but no guarantees. As a recipient of these precious lives, I have to reflect and bring myself down from the shelf of expectations and to the place of thanksgiving for the opportunity that has been given. Attached is a pic of Vivienne @ 5 months May 2013. Please contact me at sarahandaspen@yahoo.com if you want to discuss your story with me, I would love to hear from you. Josh and I went for my Anatomy Scan this week at the University of Tennessee in Knoxville. Not only would we confirm the gender, but see if both babies are developing normally. 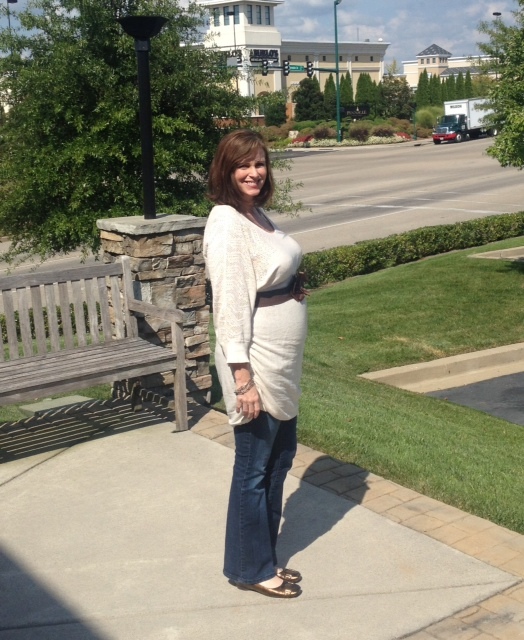 I was 19 weeks on the day of the appointment, half-way through my pregnancy. They determined my due date to be January 31st, 2015. We are happy to announce we are having a BOY and a GIRL!! To add to our excitement and relief both babies appear perfectly healthy. Baby A is a boy weighing 9 oz, and Baby B is a girl weighing 10 oz. Both heartbeats were within normal range. Although there are no guarantees until both arrive healthy and in our arms, we were relieved to get this scan behind us. With four months or less until their arrival, there is much to be done. We are trying to transition John Luke from his crib to a toddler bed, and need to soon start potty training. With a girl/boy combo we will have to update the nursery to make it more gender neutral. Also, we plan to turn our formal dining room into a playroom. It’s right off the kitchen and den making it the best location for me to keep an eye on them while preparing meals and working around the house. Since we will put the twins in what is now John Luke’s nursery, we’ve decided to put his room upstairs. The plan originally was for him to sleep with us, but since neither of us can sleep with him in the bed (he’s a kickboxer), we will see how he does in a room by himself. I’m sure, like getting him to sleep through the night, this will be a battle. Which leads me to my next point: it is bittersweet for me, but this will be my last post. I need to prepare for the busy months ahead and free some things from my schedule for after the twins arrive. I have enjoyed sharing my story, and getting to know some of you who have written in (most notably Sarah Mann Herndon, a new blogger for NEDC). Sarah contacted me through the blogs and we became fast friends. We have had so much in common from our infertility stories to the effects of the medicines, our expectations about upcoming transfers, how we will tell our children they are embryo adopted, etc. It is with some sadness I am saying goodbye, but I know I’m passing on the torch to someone who will connect with women, on many levels, who are struggling with infertility. Her passion about embryo adoption and the stories she has shared with me already- will enlighten you and encourage you. You will read her blogs feeling like you’ve met a new friend and confidante. Just as I have. If you are still on your infertility journey- The best advice I can leave you with is simple. Never ever give up on your dream for a child and always, always persevere. You too have a story. It’s just waiting to be told. Brae and Sienna each started kindergarten and preschool, respectively, last week. Brae has been excited all summer to ride the school bus, get a new backpack, eat lunch at school, and play outside during recess. I also loved school (so much that I stayed in it for 19 years straight!). In fact, when the school supplies list came out, I could almost smell the aroma of freshly-sharpened pencils. A natural high. Sienna’s preschool is at the same location as her daycare, so the excitement was not as high for her. I tried to get her pumped by getting her some back-to-school clothes, and telling her that even though she was still at the same building, she was now a pre-schooler and not just a day-care attendee. I’m not sure she bought it. The night before kindergarten, we sprinkled some glitter on each of the kids’ heads (courtesy of the kindergarten teacher), said a special prayer (that I cried during), and went to bed early. Brae even wore his entire first-day-of-school outfit (shoes included) to bed. (Yes, I did that too… maybe even beyond just kindergarten). The next morning, Brae was up bright and early, ready to take the bus. We drove to the bus stop (about 100 yards away), and Sienna and Graem and I waited in the car as we watched him board the bus. Then, I followed the bus. About 5 blocks, to school. Sienna, Graem, and I then greeted Brae off the bus and walked him to his class. He did not even hesitate walking through that pivotal door, barely mustering a “good-bye” as he skipped into his teacher’s arms. That first day, the school bus was early dropping him off, and I had not yet arrived at the stop to meet him. So (I guess thankfully), they kept him on the bus, driving around, until I could gather my frantic wits enough to call the school, who called the bus barn, who radioed to the driver to bring Brae back. Then, the second day of school, the teachers forgot to put him on the bus. So, there I stood, at the stop, eager to greet him only to realize he was not on the bus. Another frantic phone call. Then, the third day of school, I waited at the stop for him, and again he did not get off the bus. This time, however, he was on the bus, but completely unaware of when/where he had to get off. Poor little guy. So, I boarded the bus and found him blissfully in space, surprised to see me on his bus, beckoning him off. All of this made me wonder whether kindergartners should even be allowed to ride school buses at all. In fact, I was about ready to pack the whole thing in and ship him off to private school where there are no school buses. But, no, I said, he has to do this. For him. It is my job as his parent to protect him (of course), but also to instill self-confidence in him. I’m not raising a child; I’m raising a man. If the purpose of childhood is to equip my son with the tools needed to bravely face this challenging world, then allowing him to take the school bus is one big giant step in that direction. It is a new week, and he’s taking the bus again. And I’m still following it in my car. The purpose of this page is to share information on the subjects of embryo adoption and embryo donation. This venue is made possible by support from the U.S. Department of Health and Human Services under grant #1EAAPA091015-01-00. The statements expressed herein are those of the National Embryo Donation Center and do not necessarily reflect the views of the Department. We ask that participants stay on topic, and exercise mutual respect for their fellow participants. All posts and comments are subject to approval by NEDC New Media staff.